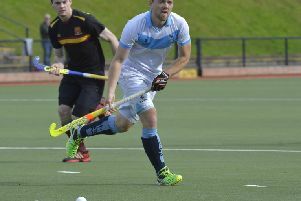 Jonny Ames sets up another attack during Cookstown's 9-0 demolition of Belfast Harlequins at Steelweld Park. Pic: Alan Donnelly. Cookstown got back to winning ways on Saturday, putting nine goals past a travelling Harlequins side, Greg Allen on target five times. Andy Barbour returned to the Cookstown squad, but the Reds were without the injured Keith Black, Raymond Miller, Paul Thompson, Matthew Rollins and Ryan Millar. Captain Greg Allen opened the scoring midway through the first half, converting a penalty stroke low to the keeper’s right hand side. Allen added his second shortly thereafter, firing home into that same corner after beating his man just inside the 25’. Despite the one-way traffic Cookstown were unable to convert again before the half-time break, leaving the score line at 2-0 going into the second. It was a different script throughout the second half; setting out to be more clinical in front of goal, a ruthless Cookstown side scored seven in the remaining 35 minutes. Greg Allen grabbed three of the seven, taking his total to five for the day. Converting a stroke midway through the second before tapping home two more, a result of some clever build-up play from Andy Smyth and Stuart Smyth respectively. Daniel Crooks was next to etch his name onto the score sheet. Linking with brother Mark along the right hand side and finally around the goalkeeper, he slapped home his first senior goal from just behind the flick-spot. With the Reds firmly in control, Stuart Smyth added another from close range before Andy Barbour made it eight, robbing the Quins’ centre-back and pushing low past the surging goalkeeper. The pick of the goals came from Andy Smyth who, carrying the ball from the halfway line, evaded two defenders before firing a reverse past the out-of-position Harlequins goalkeeper. Cookstown now face Annadale HC on Saturday for the final time this season, pushback 2.30pm, Steelweld Park.